I was staring down the water as the boat ran slowly. The engine hummed and the wind blew – there was no other sound. The water rippled gently but there was nothing but patches of black and white. I tried to bend nearer, my head hanging over the side of the boat, but the waters ran deep and so did its colors. I drifted into the blue and woke up with a stinging pain in my neck. My friends, flat on their backs, laid motionless with faces hinted of defeat. All of a sudden, the silence was shattered as the boat roared into life. Everyone curled up simultaneously leaving no trace of weakness. Without seconds to waste, everybody was all geared up beaming with anticipation and excitement. Like a race start gunshot, everyone dropped as soon as the engine halted. I looked around as I began to swim and saw manned bangcas started to crowd. Like the rest, I dipped my head in search beyond the ambiguous waters, calmly kicking forward - and there it was! Its tail waved gently from right to left, meters from the surface. I began to accelerate, never leaving it from my sight. My heart raced and my legs started to weaken, but nevertheless endured. I prepared myself for a dive closer. Gathered in some deep breaths whilst continuing to swim – and then a sudden halt. My head carelessly bumped into a small bangca. I quickly composed myself and continued the chase, but it was already so far away and I was drained. Friends started to swim pass while I slowly accepted defeat. Swimming, fining, heavy breathing - no one gave up, not even to pause. The calmness of the waters were now like waves from storms as divers paddled harder and harder. A flash of red bikini came dashing through as she swam vigorously using both her hands and fins. Either you chase or you give up the race. Instantaneously freed my hands to start my sprint. I clipped my snorkel to my mask and secured my camera under my suit and began swimming like my life depended on it. There was only one thing on my mind – to catch up - until I did. But that sprint drained me and I started to decelerate. Above the waters, a boatman came to my aid and gave me a ride to get back into the middle of the race. This changed everything. Everyone started pulling themselves up a bangca and dove back into the waters whenever they’re ready. Faces painted with exhaustion and shortness of breath, yet smiling and fulfilled. Behind me was a woman wrapped in purple suit, crawled up in front of another bangca, staring straight ahead blankly and worn-out. Still with her mask on, her gaze was far and distant, resolving herself whether she would still pursue the chase. Another woman, distinctly visible, laid flat on her stomach behind another boat. Her arms were stretched forward and her naked legs were hanging slightly above the water reflecting the brightness of the sun. Despite their looks of defeat, the pursuit continued as they followed as I dove back into the water. Below the waters, the struggle intensified - fins against fins, kicks and elbow hits. That did not stop anyone! A beautiful chaotic race of swimmers struggling against each other. I finally managed to get really close and I was just in awe. As big as a truck, it had white spots that were bigger than its eyes covering its body. Its stomach, all white and smooth underneath, had clinging fishes around. Mouth wide and open, gently swimming its way through the ocean. I was literally breathless for a moment and forgotten all the struggles I had to endure for a chance to swim with this gentle giant. 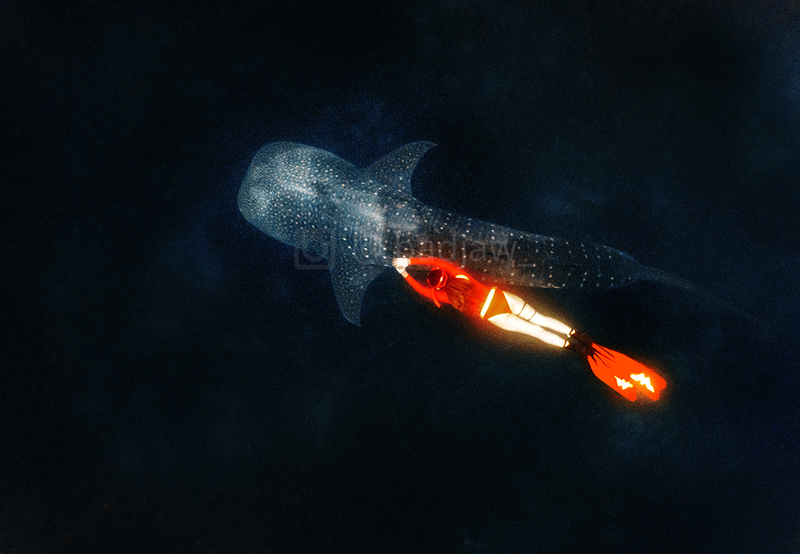 As I resurfaced to catch my breath, I thought to myself, I’d do that all over again just to swim with a wild whaleshark. We waited for almost an hour for the boatmen to find a whaleshark - fell asleep while waiting. When we finally found one, the chase started and it was very exhausting but fulfilling. This work by http://www.sowhatright.blgospot.com is licensed under a Creative Commons Attribution 4.0 International License.